For decades, paleontology was broadly a descriptive science; it was seen by many as a novelty, but not necessarily relevant to the study of modern systems. This has changed as our field has become more quantitative, but also as methodological advances have led to better dating and data that have allowed us to be more ecological and mechanistic. And, as global change problems become more pressing, folks working in contemporary systems are increasingly appreciating the utility of long-term perspectives. A paleo-perspective has much to offer conservation; we can leverage the natural experiments of past climate change, extinction, species introductions, and other global changes to better understand drivers of and threats to biodiversity in the present. Many of us go so far as to call ourselves conservation paleobiologists, an emerging field that unifies the concepts of conservation biology with the long-term perspectives of paleontology. A range map modified from Graham et al., 2005. The orange dot is the location of the fossil localities that show that the northern bog lemming (top) and eastern woodrat (bottom) lived together in the same habitat. One thing I love about working in the Quaternary is that, with the exception of some very charismatic ice age megafauna, the cast of characters is the same as today, and the stage — the geophysical setting — hasn’t changed too drastically compared with, say, Pangea. This affords a tremendous opportunity in understanding how today’s life works, and how it’s going to be affected by tomorrow’s challenges. And, increasingly, a long view of ecology is pushing back against the assumptions formed from looking at systems through very narrow slices of space or time. In my opinion, of the most important contributions that paleoecology has made to contemporary ecology (or “neo-ecology”) and conservation is this: ecological communities aren’t really useful units, per se. One thing the Quaternary paleorecord shows over and over is that species respond individualistically to changes in the environment (so, following a Gleasonian, rather than a Clementsian model). 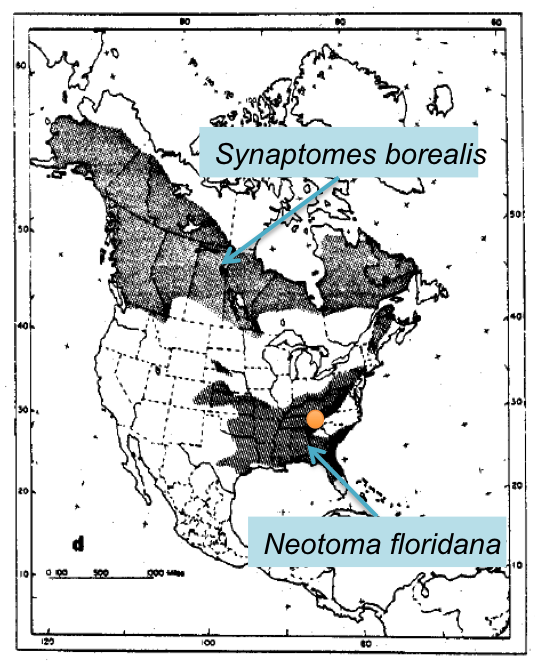 In a classic example of this from the fossil record, the eastern woodrat (Neotoma floridana) and the northern bog lemming (Synaptomes borealis) were found in the same communities during the peak of the last ice age (Fig. 1). Today, the bog lemming is found the boreal and arctic regions, and its range doesn’t overlap with the eastern woodrat at all. In other words, these two species were part of an ice age community, until the climate warmed; then one booked it north, and the other stayed put. This isn’t just interesting; it’s a serious hole in community-based conservation approaches. For decades, conservation was largely species-based, which is not only impractical at he large-scale but also incredibly weak in the face of global change (“Oops! Because of global warming, the endangered plover is no longer nesting on this beach! I guess we don’t have a legal mandate to protect the beach anymore.”). To that end, landscape- or function-based frameworks conservation frameworks have attempted to address the limitations of saving a million species at risk from climate change. For the majority of cases, species-level conservation is impractical; biodiversity per se may be what we care about in the long run. But quantifying biodiversity is still tricky, and a reserve that protects biodiversity may see individual species move in and out as the climate changes, like actors moving on and off a stage. There’s some evidence that geodiversity is strongly correlated with biodiversity; in other words, that more elaborate stages can hold more actors, ecologically speaking. Plus, geological diversity is easier to map out, and we’ve already got highly detailed geological maps in many parts of the world. So, may make sense (in some cases) to take what Mac Hunter and others called a “coarse-filter” strategy — one that focuses on the larger scales of biodiversity, rather than a fine-filter scale that focuses on the conservation of individual species. A geologic map of New England. Following a CNS approach, reserves would be designed to maximize geological diversity (or the number of colors on this trippy map). Map by Steve Dutch at UW Green Bay. The idea of “conserving nature’s stage,” or CNS, was the topic of a 2013 workshop that led to a special section in Conservation Biology last month. It includes a number of papers outlining the concepts, scientific support, challenges, and opportunities behind the idea (you can find a .pdf of the collected special issue plus supplemental information here). As the resident paleoecologist, I was part of an author team that took a “2.5 million year perspective” on the CNS approach. As I mentioned above, a paleoecological perspective should make anyone skeptical of community-based conservation frameworks so a CNS approach may make a lot of sense for some areas — especially those where we’re really short on biodiversity data. We did raise a few key issues raised in the paper, though: first, not all species are created equal, and it’s still worthwhile protecting keystone species (for example, a bison-grazed prairie is more biodiverse than a monoculture of grasses). Another issue is that not all landforms are equally “durable.” A founding principle of behind CNS is that the “enduring features” of the stage will be relatively unchanged over evolutionary timescales, and thus while there may be biotic turnover as the environment changes, the net biodiversity should remain roughly the same. Sand dunes migrate in dry periods, lakes fill in, rivers change course, cliff faces fall. In many cases, climate change will exacerbate landform change, as rates and patterns of erosion, sea level, rainfall are altered. Ultimately, climate change is going to require is to get creative when it comes to conservation; traditional strategies may no longer work, and there will be no silver bullet solution. Conservation agencies like The Nature Conservancy recognize the need to think outside the box when it comes to climate change and conservation, and many are very interested in a CNS approach to reserve design. Emerging and controversial techniques like rewilding, managed relocation of species, CNS, and potentially even de-extinction may be useful one to consider in our tool-kit, but it still need some serious science behind them. That means it’s time to put the dead to work. I stumbled across this post while going down the internet rabbit hole of casual paleobiology reading and I am so glad that I did (although a little late to the party). I went into botany with dreams of being a paleobotanist but was convinced by my mentors that it was more or less obsolete and that I needed to line myself up with my interests in either paleobotany or conservation because there would be no overlap. I chose the latter, and how wrong they were! I actually jumped up out of my chair when you mentioned conservation paleobiology. 24 hours later, I’ve got a ridiculous stack of books, papers, and my course schedule pulled up to try to cram in whatever relevant coursework I can. Thanks for rekindling that fire! A lot of my work deals with narrowly restricted endangered endemics, some edaphic. As we try to implement management strategies for these species, particularly with establishing new populations, a lot of questions have been raised that highlight the substantive holes in our knowledge about the processes that led to their current distribution and what that means for the future of these species. Great post, I’m really looking forward to going more in depth into it. Great article. I’m new to the concept of Conservation Palaobiology, but it sounds like a very useful framework. I’m currently trying to work out the major lessons that human evolution can have for current issues like climate change, species extinctions and environmental destruction (http://wp.me/p451We-6u). And your field benefits from the same long timespans that I think are crucial to conservation. Very very interesting idea! I like it and it makes sense to me (all though I did get lost a couple of times, I am not going to lie) Well thought out. Get it out there! Thanks! If there’s ever anything I can clarify, do let me know. I try to write for a range of audiences, and sometimes wires can get crossed. We are all innocent until the money runs out. I really enjoyed this post. I’m not sure that I’m convinced that the ecological community isn’t a useful unit for conservation though. There will always be wide-ranging habitat generalists, like the Bog Lemming and Woodrat, and we wouldn’t necessarily expect them to be closely linked to a particular community or interaction. However, there are also ecological specialists, and in my opinion these organisms can be useful for designating a group of interacting in a given area as an ecological community and a target for conservation. Good point, though there are also some other examples of less generalist taxa in novel associations, like black ash and black spruce 14,000 years ago.